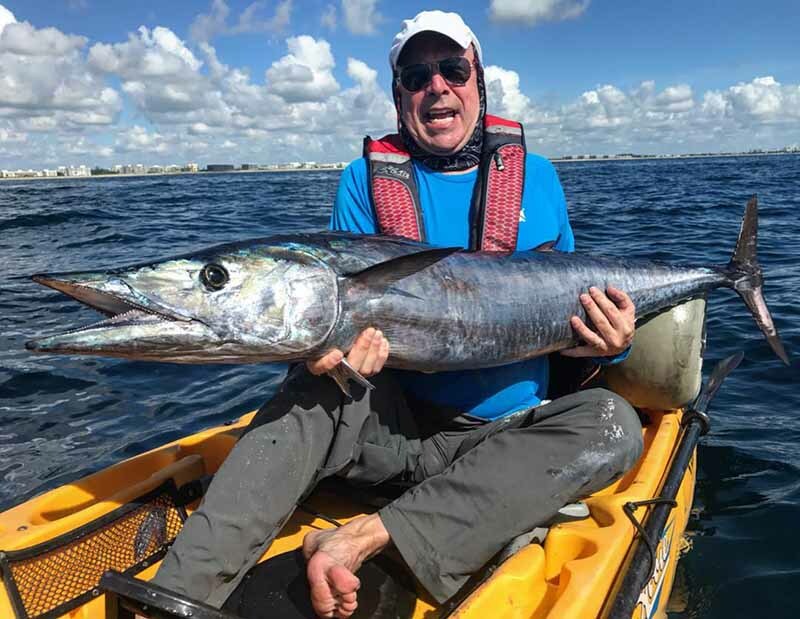 Philip with a 42-pound wahoo. His first time in a kayak! Photo credit: Brian Nelli. The mullet are here! Snook, tarpon, redfish and trout will all be cooperating this month. Matching the hatch will be your best bet during this time. Super Spooks, D.O.A. Bait Busters and anything that has the shape of a mullet will be the go to bait while kayak fishing. With the presence of so much mullet, the thought then goes to how do I get my lure to stand out. I like trying to go with colors that don’t exactly match the hatch. Try dark or bright colors to get the attention away from the group of bait. Focus your cast on the edges of the mullet bait schools and you will do well. Look to find the mahi and tuna to show back up closer to shore, 90-to-300 feet of water should be your depth range. Another thing to get excited about is the snapper bite. Look to target mutton snapper and yellowtail snapper in 60-to-100 feet of water from Palm Beach to Jupiter. I love using mullet this time of year for both bottom fishing and trolling. It is readily available and a great hardy bait to keep alive while kayak fishing. The peacock bass and clown knifefishing will really be taking off in the coming months. Look to fish structure like bridges to find the bite. Live shiners are always the go-to bait, but during this time don’t overlook a finger mullet as well. Mullet will survive in the freshwater long enough for them to be crushed by a hungry peacock bass or largemouth bass.